Elite Quality Care is dedicated to serving the senior community with dignity and respect. We want every senior in our care to feel happy to be home. We provide service and hospitality above our competitions level and we would be honored to serve you as a new resident. Our staff will pamper you with their quality service and hospitality. All of our staff are well trained and prepared to provide a level of professionalism and attention that is hard to miss. Delicious home-cooked meals and nutritious snacks. There are many benefits to receiving care in a smaller home setting. We encourage our residents to remain as independent as possible in order to retain their sense of self-esteem. The residents and staff develop close relationships with each other. The living space is not spread out and overwhelming for those with Alzheimer’s or dementia. We can take each resident’s eating preferences into account. It truly feels like “Home”. At Elite Quality Care, we know the importance of good nutrition for our residents. All three meals are homemade daily, prepared with high nutritional value, well-balanced, and tastefully presented. We also have homemade vegetarian options. Nutritious snacks are offered throughout the day as well. Our family has years of experience helping seniors make the transition to a care home. We equip you with the knowledge you need to make informed decisions so that you feel less alone as you face the many challenges of caring for your aging loved ones. If you are specifically concerned about how we care for seniors with Alzheimer’s or dementia, learn more here. 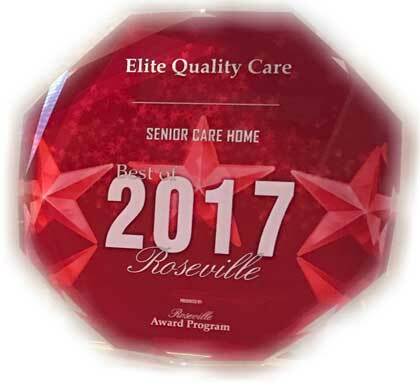 Our senior care home in Roseville, CA is staffed by compassionate and caring professionals that are trained in working with seniors and their unique needs and preferences. Please feel free to contact us at (916) 847-2528 directly. We look forward to serving you!